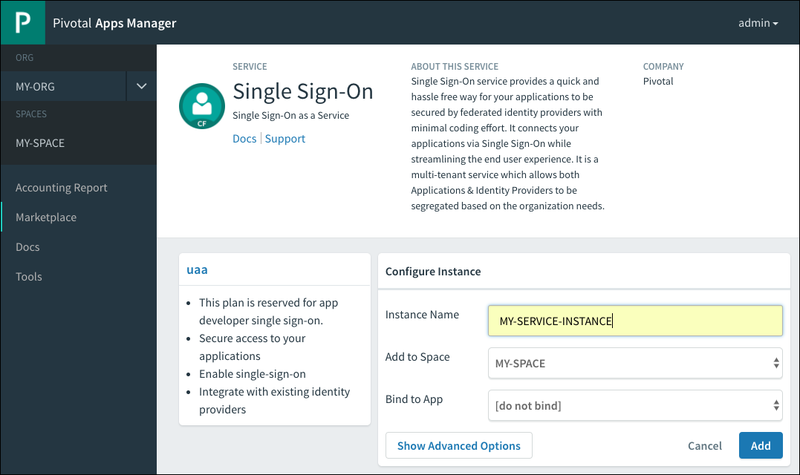 This topic explains how to use the system plan for the Single Sign-On (SSO) service for Pivotal Cloud Foundry (PCF). The system plan is the default plan meant for developer apps, not end-user apps. Restricting the visibility of this system plan to a single, developer-apps only org secures system components, following the principle of least privilege. Examples of developer apps include scripts or pipelines that push other apps and services. Any app that uses the Cloud Foundry API is a developer app. Restrict all developer apps to a single org. Make the system plan visible only to the developer-apps org. 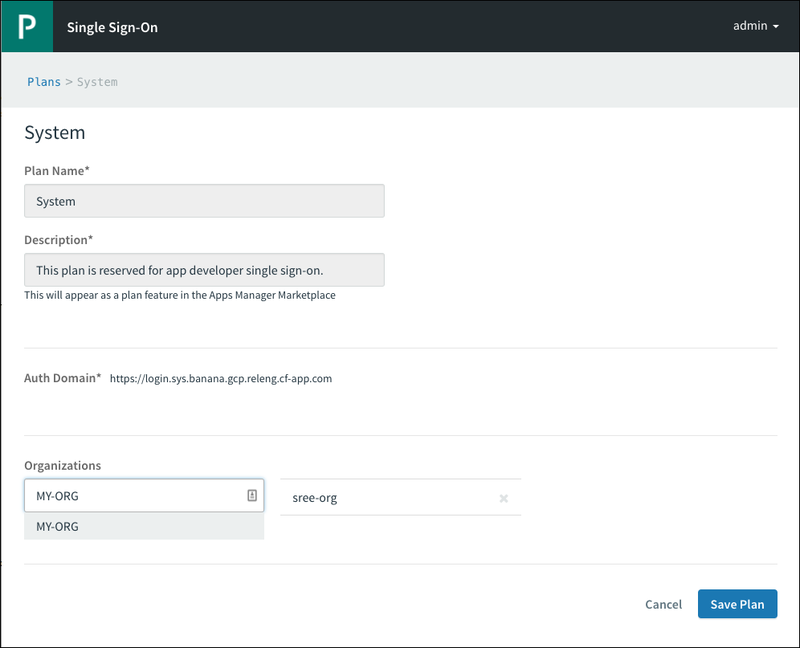 Configure other orgs with SSO service plans of their own. Developers can then self-register their developers apps in the developer-apps org for use by other developers. Log into the SSO dashboard at https://p-identity.YOUR-SYSTEM-DOMAIN using your User Account and Authentication (UAA) administrator credentials. In your Elastic Runtime tile in Ops Manager, the Domain settings show your system domain, and the Credentials tab shows the UAA Admin Credentials. Navigate to the System Plan and enable the plan in the relevant org(s). Follow the steps below to create and use the system service plan with your developer apps. Follow the steps to Create a Service Instance of SSO. If your app runs on PCF, bind the application with the service instance you created. See the Bind an Application Hosted on PCF topic for more information. Choose Native App for your application type. In the app configuration, set a value for the Refresh token lifetime based on your use case for automated access. Run uaac token sso get. At the prompts, enter the Client ID and Secret from the Next Steps section of the SSO dashboard. Copy the authentication URL from the command output. Paste the authentication URL into a browser, and log in using your UAA Admin Credentials. Copy the Temporary Authentication Code from the browser into the UAAC to finish the authentication. Copy the value of the refresh token and use that in your code to get a new token based on your client id and secret using the standard OAuth refresh token flow as described in the UAA API documentation.